Today is the very first day I am officially not allowed to work in Japan. Naturally, some guy offers to give me cold, hard cash in exchange for helping him rent apartments to foreign people. Seriously. Even if I had been in a position to take up his offer, it wouldn't have been long before he realised that the extent of my expertise in that area is "advertise in Metropolis and never, ever charge 'key money'". But still. I suppose that this will happen every day from now on, and the offers will get better and better. "Basically you just have to read books and talk about them later." "I'm looking for an Australian to taste-test this ice-cream I plan to export." "Being a Federal Breast Inspector isn't easy, but I think you have what it takes." Summary: application for new visa lodged, may take up to three months to get approved; I cannot work before that period ends; should I leave Japan while in mid-application I will need to re-apply all over again; everything rests in the hands of the good people at Immigration; until they make their decision, I am borrowing the very roof over my head from generous friends. The basic message is, "Dear [restaurant named] Marufuku (丸福). I, [the talent named] KAYAMA Yuuzou (加山雄三), wish you all the best (祝, upper right)." Now, the visual effect of a bunch of Chinese characters with no kana is classy, suggesting a quotation from, well, the classics. These characters, however, add up only to nonsense: "Spring, summer, winter / Two masu, five gou" (masu and gou are units of measurement). Akinai can mean "no (nai) Autumn (aki)", i.e. the missing element in "Spring, Summer, Winter", but it also means "trade, business" (from the verb 商う, akinau, "to do business"). masumasu, i.e. "two masu", is an adverb meaning "more and more"
hanjou is, I think, an iffy rendakued word meaning "half a shou" -- a shou being a unit of measurement equal to five ten gou (half of which is five gou, 五合). But another word with the same pronunciation is 繁盛, meaning "prosperity". So, painful to interpret though it be, it comes down to "may your business prosper more and more". I don't even know what an equivalent to this would be in English -- maybe fake Latin ("HIC RESTAVRANTO REGNET"), or using Cyrillic characters for appearance rather than sound? Final note: these puns are so common they verge on boilerplate, as you'll see if you Google them. "Magical Designer Mari-Chan". I wish to both recommend and warn you about the "Menstrual Dreamer" picture, especially if you are at work. nomimono: lit. "drink (transitive) thing", "a drink"
tabemono: "eat thing", "something to eat, food"
kakimono: "write thing", "a document, writing"
atemono: "guess thing", "a riddle"
araimono: "wash thing", "washing, laundry"
kowaremono: "break (intransitive) thing", "breakable, fragile item" or "broken item"
ikimono: "live thing", "living thing, animal"
narimono: "make a sound thing", "musical instrument"
It seems that if you add -mono to the renyoukei of a transitive verb, you get the meaning of "something which is itself [verb]ed". But if you add -mono to an intransitive verb, you get "something which [verb]s". So, my question is, is this a kind of ergative-absolutive system, or is there a simpler explanation? Special bonus complicated exception: iremono ("put [something] in [something else] (transitive) thing") means "container". In other words, even though it's formed from a transitive verb, its meaning is not "something which is itself [verb]ed". On the other hand, an iremono isn't a direct object, it's an indirect object ("I put the book into the box"), which may make it an exception to the rule. Tokyo Nobody, by NAKANO Masataki (中野正貴). Famous and striking locations in Tokyo, photographed at moments when they are absolutely free of people. You can see an example at this page, which also explains (in Japanese) his technique: wait for the big holidays like New Year's or Golden Week, and then take the photos while everyone who lives in Tokyo is off visiting their folks in the other, more rural prefectures. "But only about one out of every ten photos turns out right. Every time I'm about to take a photo, a person or a car appears." If you dig photos and you dig Tokyo, you'll definitely dig this one. Here. Not safe for work if anyone near you understands Japanese or is an ASCII art cartoon character. 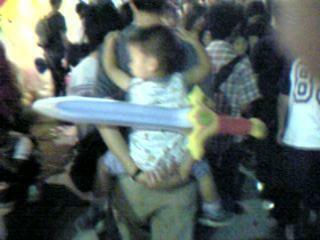 "i want a sword on ebay but what if my mom says no?" Festival season is upon us: the time when a young man's thoughts turn to the topic of how the yukata has evolved from a casual garment to one that is special and even formal in its own way, not to mention a valued signifier of Japaneseness and "girl"hood (not that there aren't perfectly manly yukata available for the guys, too, but the vast majority you see in the street are worn by girls for girly effect). "That's not a baby with a knife... this is a baby with a knife." Special bonus observation: Stitch (of Lilo & Stitch, which I quite enjoyed) is, apparently, wildly popular. Whole stalls were devoted to merchandise bearing his likeness. Masao's first line would be interpreted by any reasonable person as "I'm so hung up on Ai-chan that I go without sleep for nights on end...", and Kazama thinks "Insomnia... poor guy..."
But then Masao's second line (literally "I have dreams about [X] a lot") reveals that his first line was, in fact, only part of a sentence -- the "[X]" in my translation there. In other words, he's saying "I keep dreaming about being so hung up on Ai-chan that I go without sleep for nights on end", a gag which, in English, doesn't work (except maybe as surrealism). On the other hand, the structure of English allows us to make jokes like "I thought it was a great movie... for me to poop on! ", so we needn't feel too deprived. Via Language Hat: out-of-print A Bit of Fry and Laurie scripts online! If you're new to BOFAL, here are a few of my favorites: "Remembering Lines", "Sound Name", "Technophobia", the vox pop at the bottom of "Ironic Self-Defence", "My Dear Boy", and "For Some Reason Angry". I love the facial expressions on the two tho. plus i guess she benefits because her people have the mysterious and advanced technology of the Belt. those are probably from humans. other yayoi warriors she bested. and the girl in this picture is like the final boss. when they start fighting she suddenly sprouts six extra arms. 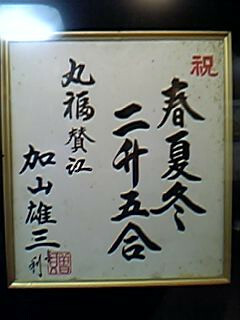 This is actually only part 甲 ("A") of the scroll, which is known as 鳥獣人物戯画 (choujuujinbutsugiga, or "picture of bird and beast characters gambolling"). Part 甲 is apparently the best part, though. It's said to have been drawn by a Buddhist monk called 鳥羽僧正覚猷, Tobasoujou Kakuyuu, or "High Priest Bird Wing, a.k.a. Draws Enlightenment", although there's no conclusive proof for this claim. But Chinese language experts said that a story could not be constructed by punctuations alone. "Using 14 punctuations to make a story is pretty like a farce," said Chen Xiaoming, professor of the Department of Chinese Language from the prestigious Peking University. "The use of punctuations has very clear rules, for instance, a full stop is used at the end of a statement or the end of imperative sentences; question mark is placed a the end of request. Punctuations are subordinates of words, which cannot be used alone as a story," he explained. Elsewhere in the world, these days, you have to inscribe your experimental novel on the bisected fetus of a cloned cow to qualify for an humorless denunciation from an expert. It warms my heart to see that China, at least, is willing to give its rogue authors the official disapproval they need. And no, I'm not being sarcastic. Even if we take out those double brackets for the reason given above, we still end up with 15 (also note that the title is one extra). Maybe those two commas are supposed to be the same character? Can any of my Chinese-speaking readers tell me what's going on with that? To follow up on last month's post about Victor and their archive of Koushien posters, this year's model has been chosen: TODA Erika (戸田恵梨香). You might remember her as the girl who got mad at her boyfriend at the zoo, but then forgave him because his cellphone could play music that she liked. Shall we dump her in the mountains out back? No, no, that won't do! Shall we bury her in the grove out back? Shall we thrash her with a willow switch? No, no, the poor thing! And she'll remember her song. I'm skeptical of this remedy's efficacy, but I suppose it's better than beating the poor bird with a stick. I've been busy with a bunch of other stuff lately, so OGAWA Youko (小川洋子)'s Hakase no ai shita suushiki (『博士の愛した数式』, "The Equation [that] the Professor Loved") took me way longer to read than it ought to. Especially since it's one of those very Japanese stories where everyone is referred to by position or descriptive nickname rather than actual name, and the whole thing verges on parable. It's got a nice hook, though: the heroine is a maid working for an old mathematics professor who, after an accident in the 70s, became unable to create new long-term memories. So, effectively, his memory is 80 minutes long. Every day he meets the maid anew, then retreats into his study to... study. It's like Memento meets A Beautiful Mind, basically. Still, it was a fun read, and I got appropriately choked up at the end, and I did appreciate the fact that there were limits to the book's sentimentality and certain things were never unnecessarily clarified. 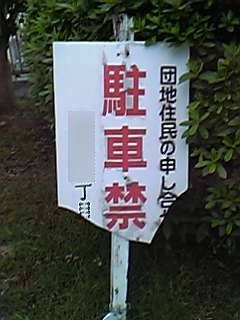 This picture of a sign with the bottom broken off, presumably by poorly parked cars, is much funnier when you know that it originally said "no parking". Look at that bow. It's bigger than her head. It's so big that she can't even make idol pose #22, "plucky fists of ganbattingu", properly. This lovely young woman's name is NAKAMURA Yuma (中村由真), and she's still active today! At the time she was starring in Sukeban deka 3 and also promoting her new single "Severe" (シビアー). The text on the right says "I want to walk around the city by myself", but I bet she's glad, in retrospect, that her handlers didn't let her go outside looking like that. You so cranky about gay folks' annexation of the word "gay"! Uh, sir. The word he gives for "switch", dondengaeshi, apparently derives from kabuki stagecraft also known as gandougaeshi (龕灯返し or 強盗返し), where -- if I understand correctly -- the set would be rolled over backwards 90 degrees, such that the current background would pass out of view and the next background would roll up from the floor and become visible. The gaeshi part of the name means "turn" or "reverse" or "switch around", and the gandou part is apparently related to a type of flashlight/lamp known as a gandoujouchin (龕灯提灯 or 強盗提灯 -- 龕灯 or 龕燈 were the original kanji, while 強盗, "robbery", were apparently ateji applied because the device was often used by robbers). As for the mimetic name, the drums would go don-den-don-den while the change was happening, is the word on the street. And so, in any case, the word came to mean sudden and dramatic change, and specialised from there. I've only been twice, but the Yayoi-Takehisa Yumeji museum complex is rapidly becoming one of my favorite places in the world. Today a fellow English teacher and I braved the relentless, mind-assaulting ur-cuteness of the NAITOU Rune exhibit. According to the Y-folk, Naitou invented modern Japanese cuteness and girl imagery, with innovations including bigger, more expressive eyes, and boyfriends. I have no idea if he deserves this much credit, but he certainly did draw girls with big eyes and... well, male companions, at least. They weren't very convincing as boyfriends qua boyfriends, especially when across the room they were cavorting in their underpants with each other in a different display. It took me way too long to figure out that soreiyu (それいゆ), the magazine which Naitou used to bust open the cuteness on postwar Japan, was supposed to be soleil. Today -- actually, last night leading into today -- is/was Tanabata, the one night in the year when Vega and Altair can get it on. Since it's a huge pan-Asian holiday with a romantic theme and summer clothing customs, the web is jam-packed with information on the topic and I won't bother repeating any here. Instead, I thought it'd be nice to see what one of my favorite suicidal Japanese writers, DAZAI Osamu, had to say about the matter. Excuse the quick translation. This year's Tanabata affected me more deeply than usual. Tanabata is a girl's holiday. It's an evening when girls pray to the Weaver [Vega] to help them become better at weaving, sewing and other handicrafts. I hear that in China they celebrate with streamers of five colors tied to the end of poles, but in Japan, we take bamboo, freshly picked and with the leaves still attached, tie paper in five colors from it, and stand it up by the door. Sometimes the girls write secret prayers on the paper, too, in a shaky, uneven hand. Seven or eight years ago, I went to the hot springs in Joushuu, but thanks to all kinds of trouble I couldn't stay on top of the mountain in the hot spring so I wandered down to Minakana at the foot of the mountain. When I crossed the bridge and came into the town, it was Tanabata: red, yellow and green colored paper was rustling beneath the bamboo leaves. Ah, everyone's living so modestly, I thought, suddenly feeling revitalised. I can still remember the colors of that Tanabata vividly, but I didn't see that kind of decorating of the bamboo for a few years after that. Well, no, I guess I saw it every year, but it never made an impression on me. But, for some reason, this year the Tanabata decorations standing here and there around Mitaka really caught my eye. 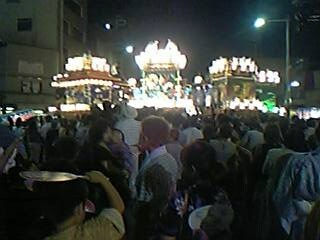 That made me want to know exactly what kind of festival Tanabata is, and so I looked it up in two or three dictionaries. But whichever dictionary I checked, all that was written was "Festival during which people pray to become better at handicrafts". That didn't satisfy me. I had been hearing ever since I was a kid that it had some more important meaning. Wasn't this supposed to be the one night in the year that the Cowherd [Altair] and the Weaver can enjoy each other's company? When I was a boy, I believed that those colored paper and bamboo decorations we put up were for the benefit of the Cowherd and the Weaver, a sign to show that we were happy for them this night. In other words, I'd thought it was a holiday for we in the world below to celebrate the Cowherd and the Weaver's yearly good fortune, so now hearing that it was a night for girls to pray that they would get better at writing and darning, and that those bamboo decorations were also just to hold the prayers, well, it felt a little strange. Man, I thought, girls seriously don't miss a beat when it comes to figuring out ways to get theirs. Putting together this plan where they attached their own requests to the general goodwill for the weaver is just way too calculating. Grasping, even. Most of all, it was just cruel to the weaver. Tonight's the night she's supposed to be enjoying her once-a-year meeting with her man, but the clamoring flood of petitions from the world below must totally ruin the mood. But, since that night's so good to the Weaver herself, she probably has no choice but to listen to the wishes of the girls below too. And so the girls see that weakness in the Weaver's personality and without any reserve or consideration busily make their requests. Sheesh. Girls are like that right from the cradle. But boys don't do that sort of thing. They know that it's not polite to bother the weaver with greedy wishes on a night she'd rather not have everyone bothering her. Hell, I've refrained from even looking up at the sky on Tanabata, ever since I was a young boy. I was just wishing, deep within my little chest, that they could enjoy a fun night without wind or rain getting in the way. I thought looking at lovers who can only meet once a year, through a telescope of all things, was completely rude and utterly without class. I would have been ashamed to act like such a peeping Tom. Thinking about these things while walking around town on Tanabata, I suddenly wanted to write a novel. It'd be about lovers here in the world below who have also promised to only meet once a year. Or maybe a married couple who for some unfortunate reason can't live together, that'd work too. On that night, the bamboo and colored paper decoration would be standing by the entrance to the woman's house. DEAR STARS, PLEASE WATCH OVER JAPAN. What a relief! The girls of today aren't just wishing for things for themselves. This request was more innocent, I thought. I read those words on that colored paper over and over again. I couldn't leave for a while. This wish will definitely get to the Weaver, I thought. Its humbleness was its greatest asset. Ever since 1937, Tanabata has started to mean something different to Japan. The 7th of July, 1937: the day of the Marco Polo Bridge Incident, the unforgettable gunshot. My cheeky ponderings evaporated completely, like mist. That's the biggest problem with reading things written during the 1930s and 40s in Japan. They start off entertaining, and then raise those uncomfortable, uncomfortable issues, and you're just not sure you should be enjoying them any more. Dazai's politics weren't exactly the pacifist, anti-fascist kind, but nor was he a vicious warmonger -- and plus, on a personal level, he'd made at least three suicide attempts by the time he wrote this. What are you supposed to make of that? I've discovered that I can distract myself from pressing problems that can only be solved by waiting (and, subsequently, seeing) by reading the science fiction of my youth. Over the last couple of days I re-read Stranger in a Strange Land, and, seriously, I love Heinlein. It's the self-insertion. I can't recall a single one of his books that didn't contain at least one Gary Stu -- a crusty old libertarian male genius with beautiful young female genius companionship -- but Stranger has got to be the pinnacle of his craft. Jubal is not only crusty, old, libertarian, male and a genius, he's also a writer (as well as lawyer, doctor, etc.) who has three beautiful young secretaries who kiss his bald patch and, in short order, welcome an attractively distraught nurse to the harem, too. He doesn't care about money, but he has so much that he can laze by the pool all day dictating fiction to his staff -- because, yes, he makes enough as a writer to maintain a full-time, in-house staff of five people. He cuts deals with the head of the One World Government, mercilessly cuts down various sneaky foreign governments, and, of course, becomes a beloved and respected father figure to Mike, the Man from Mars himself. All of this is at least physically possible, but what I find most endearing about the Jubal character is that he is the only human who can think like a Martian and understand grokking without actually learning Martian. The only one. We get this on authority from Mike himself. This is straight-up magic, and it catastrophically undermines the whole "grok" thing. But I guess poor old Heinlein just couldn't resist. Like Frank Miller's Batman, I had intended to stay retired. But there are some things a man cannot let pass. Q: What do you think of the swimsuit you're wearing now? A: It's bright and matches my image, so, I like it. Q: If you were to describe yourself in a phrase...? When joy, anger, sorrow, and pleasure have yet to arise, this is called the Middle (中); when they have arisen and are all in moderation, this is called Harmony (和). The Middle is the Great Root of everything under the heavens; Harmony is the path (道) that everything under heaven follows. Enable both the Middle and Harmony, and heaven and Earth will be in position while the myriad beings flourish. OK, I kind of fudged that last sentence. Also, note ye well, o character nerds, the old-school 樂.
I'm as mad as the Burning Hell of String-Like Worms, and I'm not going to take it any more! What's up with the mythical women in this country? How come only the snow ladies and the foxes are willing to marry a guy? I work hard, I bring home a paycheck after having spent no more than 45% of it on secondhand books about 16th-century Buddhism. Seriously, what more can I do? GRRAAGH!! Bumpy Trot is a game which looks like fun and is set in an alternate Earth where bipedal vehicles were invented shortly after cars. You also get to play harmonica. That is all. "You drinkin' me? You drinkin' me? Then what the hell else are you drinkin'? You drinkin' me? Well, I'm the only beverage here. What do you think you're drinkin'? Oh yeah? Huh? Okay. "Remember, you're only as healthy as you feel." Maybe I've mentioned this before, but I really appreciate the method that Japanese publishers use to festoon their books with promotional hype. They don't print it on the cover: they put it on the obi (or, more formally, obigami (帯紙), "sash paper"), which you can then remove as soon as you get home (and use as a bookmark). This means that cover designers can work in peace without having to sandwich in "Winner of the Bunglefloot Flap award" or "'Magnificent!' -- Similar Author, Similar Book" or, worst of all, those goddamned embossed gold medallion things. "Hey! I'm a goofy guy having summer fun, reading underwater! 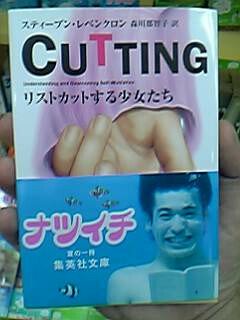 ... about, uh, self-mutilation among young girls. Yeah... non-fiction. So, anyone wanna play frisbee?"